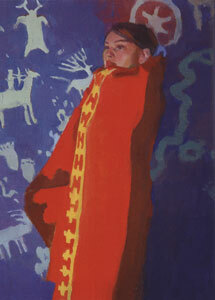 Ray Roberts, Red Blanket, Oil on Canvas, 16" x 12"
Trading posts were quite common in the early settlements of Canada and the United States for the exchange of such things as fur, precious metals like gold, silver and copper, and other goods. They also provided places for people to meet and exchange the news of the world before the advent of the newspapers. In celebration of these historic icons, Medicine Man Gallery in Tucson will present dozens of new works by six of its acclaimed artists in a group show titled Historic Trading Posts of the West. 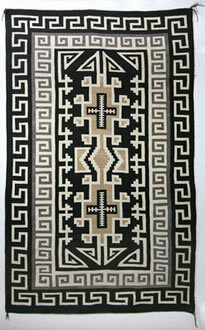 The show runs Feb. 28 through March 28, with a reception on Feb. 28 from 6 to 8 p.m.
Navajo Two Grey Hills textile, Two Grey Hills Trading Post, c. 1930, 75" x 47"
Participating artists are Susan Kliewer, Francis Livingston, Ray Roberts, Sue Rother, Star Liana York and Dennis Ziemienski. Expressions in canvas and bronze will be represented, as well as Native American antiques, trading post memorabilia and photography, providing at least 70 works on exhibit and for sale. 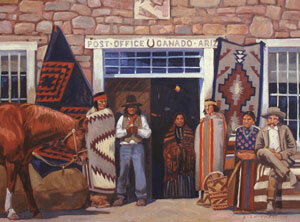 Dennis Ziemienski, Post Office - Ganado, Ariz., Oil on Canvas, 30" x 40"
In preparation for this show, several artists such as Dennis Ziemienski visited the Navajo reservation and spent time at different trading posts. In his new piece, titled Post Office-Ganado, Ariz., Ziemienski depicts the historic Hubbell Trading Post located in Ganado, emphasizing its architecture and figures of the period. Declared a National Historic Landmark in 1960, it is still active today. “Interestingly, it’s one of the posts in the area that’s as it was when it was in use,” says Ziemienski. A former illustrator, Ziemienski will present several works in this show including studies. Another scene based on his visit to the Navajo reservation is titled Teec Nos Pos Gasi. Here, he depicts a 1930s version of a trading post with a car, gas pump and figures. Francis Livingston, Distant Storm (Chimayo Trading Post), oil on panel, 14" x 18"
Francis Livingston emphasizes time of day and wagons in his new work. Not quite nocturne scenes, he incorporates deeper, darker skies while placing trading posts with backdrops of early evening, where low light hits part of a figure or a building. 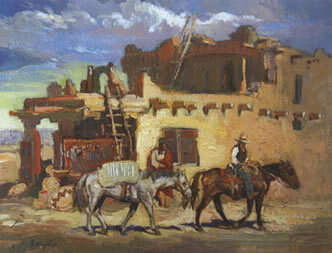 Livingston alludes to an obscure post in New Mexico in his painting titled Distant Storm (Chimayo Trading Post). “I like the building because it’s an old adobe building,” he says. 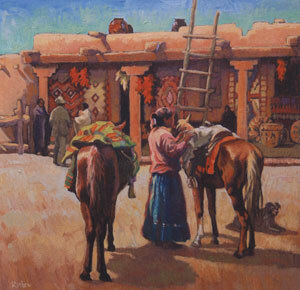 Sue Rother, Summer Trade, oil on panel, 12" x 12"
Livingston’s wife, artist Sue Rother, draws inspiration for the new work from Taos Founders Ernest L. Blumenschein, Victor Higgins and E. Martin Hennings, as well as the distinctive beauty, shapes and color of the Southwestern landscape. An illustrator for 30 years, color and design has played a key role in her art. In her painting title Summer Trade, Rother uses the warmth of color and close cropping to convey a feeling of intimacy, “as though the viewer is there observing or participating,” she says. 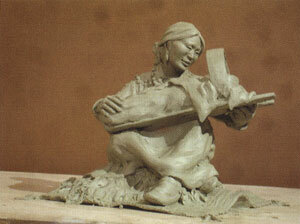 Contemporary Southwest sculptor Susan Kliewer continues to portray the Navajo people she knew and loved when she managed the Marble Canyon Trading Post. Always striving to show the common thread that underlies all human experience, Kliewer captures the deep unspoken bond between a mother and child in her latest piece titled Shima, which is Navajo for mother. Another acclaimed sculptor, Star Liana York, is best known for the variety of her subject matter and for the emotions that her pieces evoke. York’s Fabri of Life suite, consisting of four sculptures that reflect the four seasons, will be represented n this show. Drawn to his native California and the desert of Arizona, artist Ray Roberts has found a way to combine his passion for both landscape and figures. His new paintings, Yesterday’s News and Red Blanket, continue to explore his fascination with the Navajo and their rich culture. Although the subjects may appear to be simple, he says, they are not and he took risks with the complexity of each painting. 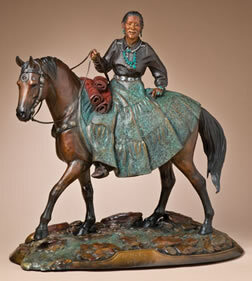 Star Liana York, To Market, Bronze Edition of 35, 25.5" x 25" x 10"